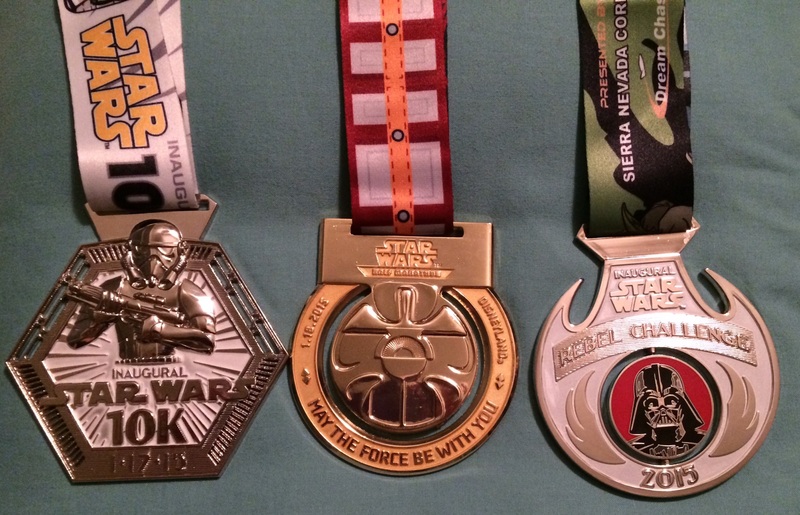 “Join me and together we can run the galaxy”….or at least that is the line I used to convince my family to make the 2200 mile trek to Anaheim to participate in the inaugural Star Wars Half Marathon Weekend. After months of preparation, our 3-race whirlwind vacation seemed to be over in the blink of an eye! The three new medals that I have added to my collection are so awesome that they make my enormous post-vacation laundry pile seem not so bad! From the opening of the Health and Fitness Expo to the half marathon finish line—read on for my recap of this inaugural intergalactic event. The weekend began on Thursday with the opening of the runDisney Health and Fitness expo. The expo opened at 10am and my sister and I decided that we were going to hit the official race merchandise section first. For the Wine and Dine Half Marathon, I sent my parents to the expo two hours after opening so that they could snag me a Wine & Dine Half Marathon zippy sweatshirt. They were completely sold out—two hours after opening! I did not want to meet that same fate with this race. However, I suppose I never realized just how popular Star Wars really is. We arrived at 9:45am and had expected to wait in line—but not a line like this. We were persons #850 and #851. Evidently, the first people in line had arrived at 6:15 that morning. We were given color-coded wristbands which indicated our place in line and were then directed to a taped off section within a very large ballroom with the instructions that we could only leave to use the restroom. The line began moving at about 9:55, with each line allowed through the doors at 5 minute intervals. We waited about 40 minutes before it was finally our turn to go through the doors. Once through the doors we were taken through a hallway, down the stairs, and into the actual Health and Fitness Expo….where we were put into ANOTHER LINE! We waited in this line for about 45 minutes as they were only letting so many people into the merchandise “tent” at a time. We approached the entrance to the tent at 11:30 and got excited that it was finally our turn, but would you believe we were stopped right at the entrance? 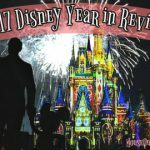 I begged the guy working the entrance to let my sister and I go through—we had dining reservations at 1140 at Blue Bayou and I knew that if we did not get into the tent at that very moment there would be NO WAY we would make it. The guy was very sympathetic and let us through. Thankfully, my sister and I had devised a plan of action while we were waiting in line, and in no time at all we had all the items we wanted and were checking out. Couple of things about the merchandise tent: First, while the first day was really crowded, when I went back on Saturday there were only a few people shopping—so no line whatsoever AND it looked to me like all the items were still in stock. Second, I was disappointed that they did not have any 10K merchandise, no t-shirts, pins, or sweatshirts—very disappointing for those in our group who ran the 10K. Third, and this is just my personal opinion, it was really aggravating to see official race merchandise for sale on EBay while I was still waiting in line on Thursday. While I understand that some people make a living buying and reselling merchandise, it is often irritating to those of us who are actually running the races to not be able to buy commemorative items because the items have been snatched up for resale. I think runners should get first crack at all merchandise –maybe that first day of the Health and Fitness Expo could be reserved for participant sales. After that, everything can be fair game but at least those of us who are actually running the race can have the opportunity to buy items that commemorate our hard work. The Health and Fitness Expo was held Thursday through Saturday at the Disneyland Hotel. 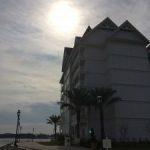 There, guests could find various fitness related vendors, listen to guest speakers, and of course pick up race packets. We decided to pick up our packets mid-afternoon on Thursday to avoid the initial rush and beat the after work crowd. We had no problem at all picking up all of our packets. The lines were little to non-existent for the 5K, 10K, and Rebel Challenge packets and the race t-shirt pick up lines were also very short—that was a total plus for us since we had 9 packets to acquire! 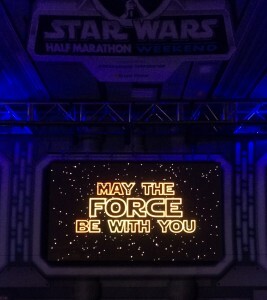 The Star Wars 5K began near ESPN Zone at 5:30am on Friday morning. My sister and I decided to be on the other side of the race this time and opted to be voluntEARS. 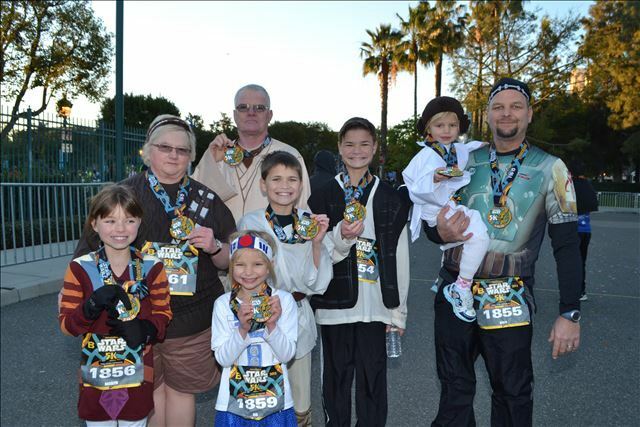 The rest of our family did run this race and the group consisted of my mom, my dad, my husband and all five of my kids. There were three corrals for the 5K with the A corral starting at 5:30am and subsequent corrals staring at about 10 minute intervals. The 3.1-mile course went through both Disneyland Park and Disney California Adventure. There were two drink stops along the course as well as several character photo-ops. I am told that the lines for the characters were really long and cast members were not allowing people to stop. That was a bit disappointing to my family since that was a big appeal of this event—especially for my boys. Despite that, my gang had a great time and they were so excited to receive their finisher’s medallions. I was assigned to the bag check area for the 5K and with a pretty good spot near the jumbotron, I was able to see them all cross the finish line! The 10K began bright and early on Saturday morning. The corrals were just a short walk from our Harbor Blvd hotel. Participating in this event with me were my husband, my sister, my dad, and my oldest son (14). Since our assigned corrals were different, we opted to start in corral “C” so that we could all run together. There were a total of 5 corrals (A-E) so that put us right in the middle of the pack. After the National Anthem and a surprise visit from C3PO and R2D2, the first corral was sent out on their way with subsequent corrals starting at about 5 minute intervals. The course was great. There were three “hills” right in the beginning, but after that we were on pretty flat ground. The course took us through Disneyland Park—which was incredible. 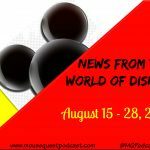 The course did NOT take us through Sleeping Beauty Castle, but we did run past the front of it as we traveled down Main Street, U.S.A. Right around mile 2 we were able to get a group selfie with the castle in the background. The course took us through Adventureland, Tomorrowland, and Fantasyland and then around the outside of Disneyland Park. 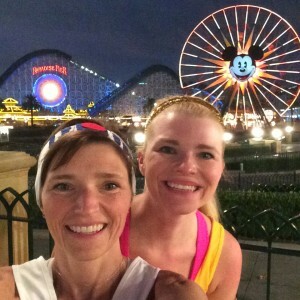 We then ran through Disney California Adventure and to the finish line located at the Disneyland Hotel. There were three water/Powerade stations on the course. There were several character stops also located throughout the course but, in my opinion, there were not enough. We stopped right around mile 2.5 because my son really wanted a picture with Chewbacca—something he missed out on the day before during the 5K. We waited in line for almost 30 minutes and nearly got swept because of the wait!! With our group at about 10:30/mile pace and starting in the middle of the pack, that shouldn’t have happened. My husband REALLY wanted a photo with Darth Vader, but we did not want to take the risk of stopping again…. And that line was TWICE as long! It was kind of a bummer because, again that is a big appeal of doing a runDisney race—character photo-ops. It would’ve been nice if those main characters had been available after the race so that we could’ve had our picture taken with them once we crossed the finish line. All in all, it was a great event. Nice course and beautiful scenery with the only downside being the lack of/lines for character photos. The ½ marathon began much in the same way as the 10k. We started promptly at 5:30am. For this race it was just my sister and I and we started in corral B. 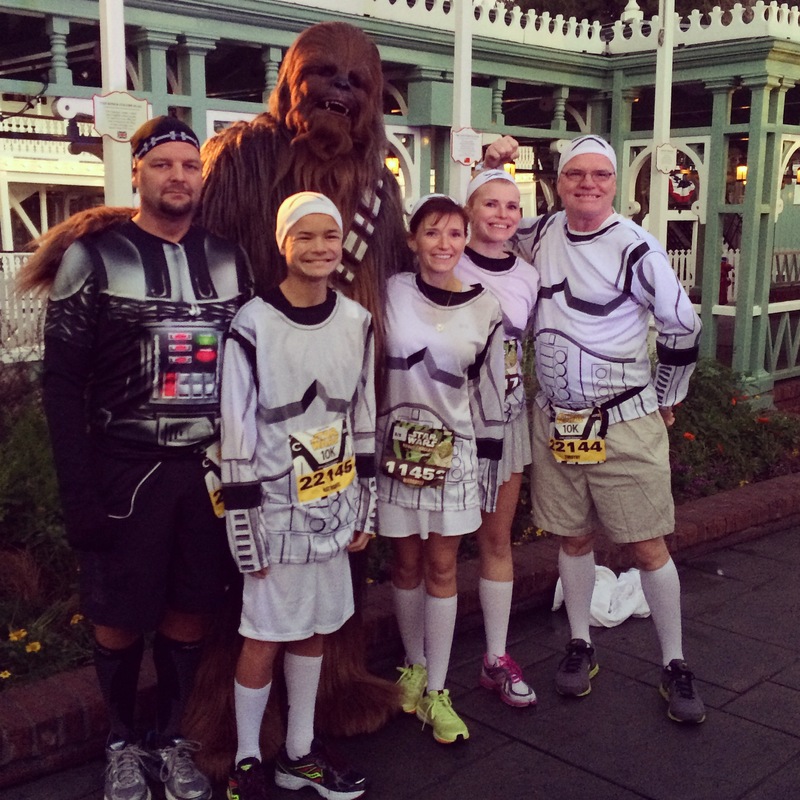 Once we crossed the “bib check” point for corrals A and B, runners were able to have their photo taken with..guess who…Chewbacca! That would’ve been nice the previous day. Anyways, since we were in corral B, we began our race at around 5:40. The first part of the course was very similar to the 10K course running through both Disneyland Park and Disney California Adventure Park. Upon leaving Disney California Adventure, we began our nearly 8.5 mile course through the streets of Anaheim. Now, I know that there are many runDisney enthusiasts who feel that Walt Disney World races are better than Disneyland races because the Disneyland races run through the city. I COMPLETELY disagree. I LOVE running through the streets of Anaheim. There was so much to look at to keep my sister and I distracted while running—much better than the vacant highway we run when at Walt Disney World. The best part was all of the local people that came out to cheer us on. There were local fans everywhere along the course–some offering us runners snacks and drinks (from their own homes) and all offering much appreciated words of encouragement. It was incredible to see such community support—especially since we runners had taken over their streets for several hours that morning. After making the loop on Harbor Blvd and down Katella Ave, we made our way to the Disneyland Hotel to the finish line. There were 9 water/Powerade stations located on the course. Right around mile 8, Cliff Shots were available in various flavors. There were many, many groups of local folks who were handing out licorice, pretzels, oranges, bottles of water and even mints to runners too. There were more characters available along this course—although the line for Darth Vader was still too long. As a registered Rebel Challenge participant I received THREE race t-shirts, one for the 10k, the ½ marathon, and a special “Rebel Challenge” shirt—all were long sleeved ladies cut tech t-shirts and all had the word “inaugural” on them. 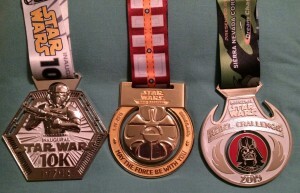 I also received THREE medals—one each for the 10K and ½ marathon and then the third for completing the Rebel Challenge. They have made very nice additions to my race medal rack, although I will admit, I still have the Rebel Challenge one on my nightstand. Overall, I think it was a pretty good race weekend. Aside from our little problem during the 10K and the lack of character photo opportunities during the 5K, the events were otherwise well planned and the courses well managed. The swag was pretty good and the finisher’s medals were nicely designed—although it was a little disappointing that the ½ marathon medal does not have “inaugural” engraved on it. I think I would definitely do this event again sometime, maybe when the boys are older and can both do the Rebel Challenge with me. 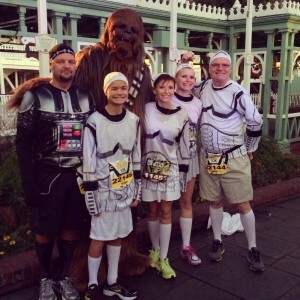 I would certainly recommend this event to any runner who is also a Star Wars enthusiast. 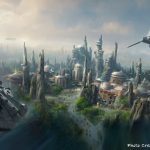 I am sure runDisney will make some interesting additions to next year’s event that will include aspects from the new movie that is set to be released later this year. 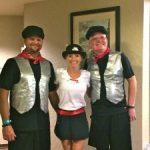 I’m little sad that the weekend seemed to come and go so quickly, especially since this will be my last runDisney race for a long while. I feel pretty lucky that I was able to be a part of this monumental event and what made it even better was being able to share it with my entire family. 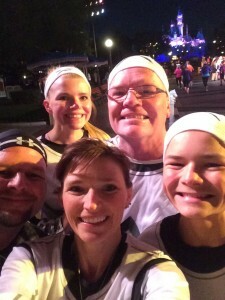 There is really nothing like running a Disney race with your loved ones by your side. Good luck to all those who are participating in upcoming runDisney events—May the Force be with you!